The Vertical Open/Closed Sliding Sign Board not only notifies customers that your business is open or closed, but also lets them know your hours of operation. The open/closed sign comes with 360 Helvetica font letters, numbers, punctuations, and symbols to fully customize your message. The sign measures 14”W x 20”H and easily attaches to any window via suction cup. 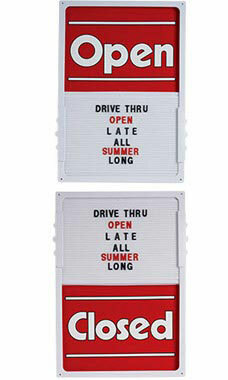 Store Supply Warehouse offers a variety of signs to help promote your business.